Passionate fans of Red Sox baseball should already know the story of Dave “Boo” Ferris. When he was just a kid, growing up in Mississippi, he broke his right wrist so he learned to throw lefthanded while his wrist healed. Afterwards he would pitch with his right hand and when not on the mound, he’d play first base as a left-hander. He received a full scholarship to play baseball at Mississippi State and after two seasons of college ball, he signed a contract to pitch for the Red Sox. He went 7-7 for Boston’s Greensboro affiliate in the Class B Piedmont League and was then drafted into the Army. He joined the Army Air Corp and perhaps because he suffered from chronic asthma, he was assigned to serve out the war as a physical education instructor at a flying school in Texas. A severe asthma attack got him discharged in January 1945 and he went home to Mississippi to recover. A few weeks later, the Red Sox asked him if he could attend the spring training camp of their Louisville Minor League team and Ferris felt strong enough to do so. It was there that the Manager of the Cincinnati Reds, a guy named Bill McKechnie saw Ferris pitch and he contacted Red Sox Manager Joe Cronin to see if the Reds could make a deal for the then 23-year-old pitcher. At the time, Boston needed pitching just as badly as the Reds, so instead of making a trade, Cronin started paying attention to Ferris. By the end of April, Boo was on the Red Sox big league roster. In his first start against the A’s, Ferris overcame some early wildness and pitched a 2-0, five hit shutout. In his second start, Ferris threw a seven-hitter at the Yankees, shutting out Boston’s arch rival, 7-0. It was one of the most impressive starts of any Boston rookie pitcher in history and as Ferris turned it into a 21-10 rookie season with a 2.96 ERA and five total shutouts, the whole country took notice of the new kid pitcher in Beantown. Boo then turned the sophomore jinx theory on its head by going 25-6 in 1946 with six more shutouts and leading Boston to the AL Pennant. He then shutout the Cardinals in Game 3 of the 1946 World Series and held St Louis to just three runs over seven innings in Game 7. 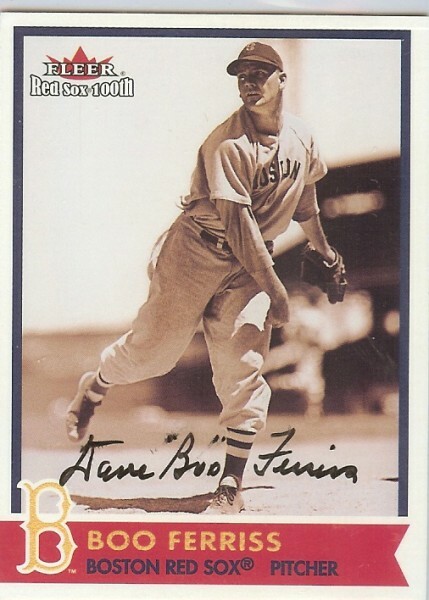 Boston fans had every reason to believe that Boo Ferris would be the ace of their staff and one of the all-time great pitchers in franchise history for the next decade. That didn’t happen. The youngster had pitched a total of 538 innings of regular season baseball in ’45 and ’46. He had never before thrown more than 140 in in any single year of Minor League ball or college. The consequences of that heavy pitching load came to bear on Ferris’s left shoulder in the third inning of a Sunday afternoon game against the Indians at Fenway Park on June 22, 1947. Cleveland center fielder, George Metkovich was at the plate with the bases loaded and Ferris was trying to put some extra special spin on his curve ball when he felt and heard something pop in his shoulder. He was still able to pitch. In fact, he somehow didn’t miss a start that year until September, months after the injury occurred. He was just never again able to put any power into his pitches. Over the next few seasons his right arm went completely dead and he was forced to give up baseball. He pitched his last big league game in a Red Sox uniform in 1950 and retired with a 65-30 lifetime record. Many who saw him pitch will tell you that if that left shoulder never popped, Ferris would be in Cooperstown today. He eventually became the head baseball coach at Delta State University after his playing career ended, and remained in that capacity at the Mississippi school for 26 years. Boo Ferris still lives in Mississippi and he turns 90-years-old today.